Monster squash plants in my hoop house! Do you grow cucurbits in your garden, and do you live in the Western Hemisphere? Then you, gentle reader, probably have squash bugs. Have you ever gone out to check on your infant squash plants, only to find that one or more of them have collapsed in a sad heap in your garden, never to rise again? Then you probably have squash bugs. Do you have nasty, scuttling, hard-shelled and constantly-embarrassingly-really! !–in-mating-position-dark colored bugs scooting all over your pumpkins and squashes and cucumbers? Then you probably have . . . you guessed it . . . squash bugs. If you don’t live in the Western Hemisphere, you may still want to read this post, since you never know when these nasties will make it over to your enviably-squash-bug-free part of the world, and show up on your pumpkins or squashes. It might happen. 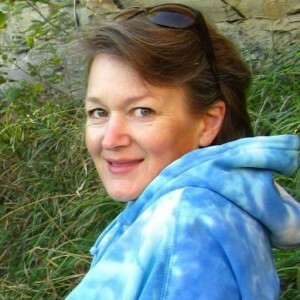 How clever your neighbors will think you, if this happens and you’re already armed with knowledge which will astound others in your sphere: what the doggone pests are, and how to get rid of them. And all this, without resorting to nasty pesticides that could harm your dog, the local honeybees, and perhaps even you. (By the way, the term “cucurbits,” in case that word is on the edge of your working vocabulary, refers to melons, zucchinis, squashes, and pumpkins). The infamous Squash Bug (there are over 1800 species that fit under the genus Coreidae–1800!!) is the most serious pest for squash and pumpkins in the U.S. and is a potential problem for all cucurbits. If you’ve ever noticed squash bugs in your garden, you’ll know that they damage plants by sucking juices from the leaves and fruit. What you may not realize is that they also inject a nasty toxin that can cause a plant to wilt, blacken, and even die. Nasty, nasty bug! And he’s pretty doggone homely, to boot! Squash bugs are easy to identify, as are their eggs (laid in orderly rows on the undersides of leaves) and nymphs (soft-bodied and grayish, in clusters on the bottoms of leaves). Adult squash bugs are about 5/8″ long and are dark brown or mottled in color. They are hard-shelled and give off a nasty smell when squished. They also have an unnerving practice (in my opinion) of scuttling about when you are aiming (with a gloved finger) at squishing them, and they also have an unsavory habit of clustering about in mating couplets everywhere in your squash plants. In the daylight. In front of the children, and everything. So that’s the bad news. The good news is: with a bit of work and a bit of planning and some sleuthing and decisive action (is that too much to ask?) 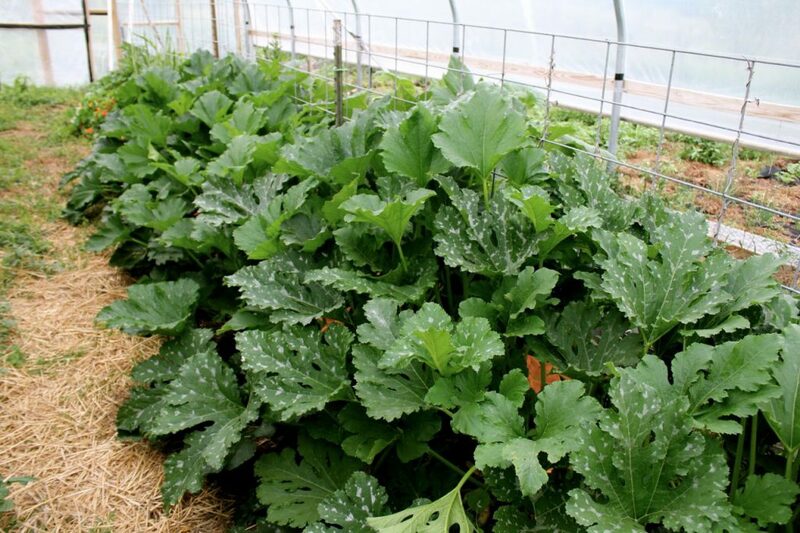 you can rid your garden of squash bugs, and keep your cucurbit plants growing and thriving and producing wonderful edibles for you until the natural end of the season. So let’s get started. Your first line of defense is preparation of your next year’s garden bed in the fall. Squash bugs will overwinter in garden debris, certain types of mulch, and pieces of boards or other detritus that may be lying around your garden. So, cleaning up the garden in the fall is very important. If you have a serious squash bug infestation this year, don’t work the affected plants into your soil, but remove them and bundle them up and toss them out, or burn them. I know this is a hard call for serious organic gardeners, since you really want all the nutrients and organic matter that you can find tilled into the soil. But remove the affected plants, you must. 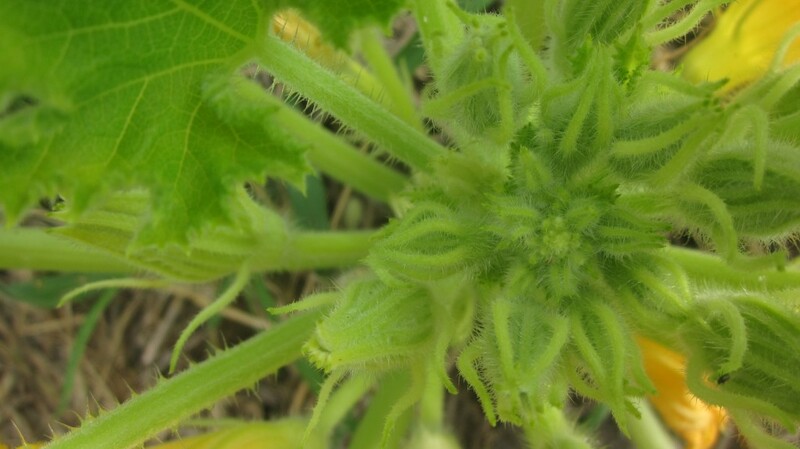 Your second line of defense is to do the aforementioned sleuthing, in searching out the squash bug eggs on the bottom sides of the leaves of your cucurbit plants. They are easy to find. You may marvel momentarily at the glossy little brown eggs (as do I), laid in such orderly formations, but then you must not get attached. Nay. 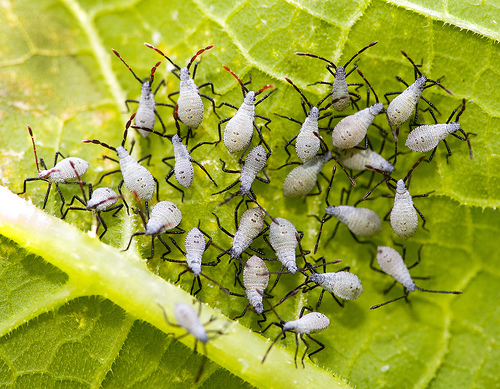 You must squish them to smithereens (being careful not to harm the leaves) and wish them a not-fond “Adieu.” If you destroy the eggs, of course, the squash bugs cannot hatch. Ergo. No squash bugs. It really is amazing, how orderly these eggs are laid. We all could learn a thing or two from the compulsive order displayed by the squash bug, could we not? Well. At least I could (cough). 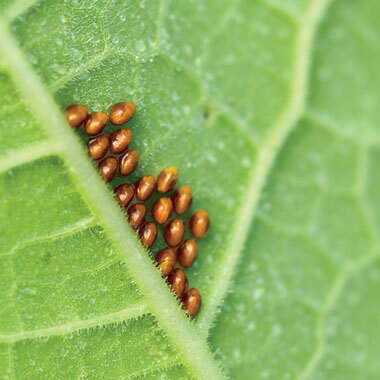 A third line of defense, (and something every organic gardener will generally try to do anyway), is to be hospitable to creatures in your garden which will eat nasty bugs such as the squash bug, just in case you miss some of those eggs. Just this very morning, Gentle Reader, little Mack came running to me with a jar in his hands, very excited about something that he had caught. It was a praying mantis. 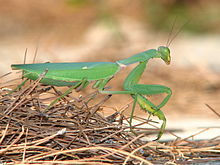 Praying mantises, of course, are a very picturesque and beneficial creatures, and I wholeheartedly encourage their existence on our place, especially in my garden. Because I had noticed some squash bug nymphs (soft-bodied creepy little bugs) on a squash plant earlier, I invited my son to do an experiment with me. Now where I marvel at the squash bug eggs, I recoil in horror at the squash bug nymphs. They are frankly disgusting to me, with their soft gray bodies and their dark spindly legs and their habit of lurking quietly on the undersides of the leaves just sucking away . . . .
YICK! Anyway, little Mack and I carried that praying mantis out to the garden, and found right away a plant with a bunch of nymphs creeping around on the underneath of a leaf. We set the mantis down (it was a very pretty one, by the way, kind of a pearly color and had a charming habit of tilting its little triangular head at us) near the nymphs. Snap! It grabbed a nymph and ate it, right then and there. We were thrilled, to put it mildly. Praying mantis, 1. Creepy nymphs, 0. Of course, if you perhaps miss a cluster of eggs now and then, and therefore have a few squash bugs and/or their creepy nymphs which are giving you fits in your garden, there are things you can do to control them. I’ve read of several solutions that I’ll share with you. Mother Earth News has advice on their website which recommends making a solution of water, onion slices and garlic scapes, and letting it sit until it starts to stink–just a day or two. They recommend that you then pour it around affected plants and it is reported to kill squash bugs and keep them away. Of course, it may discourage you from going anywhere near your plants, too, so you’ll have to prepare yourself for that, of course. Iowa State University Organics Research Program found that mulching with newspapers and hay, and then attaching row covers securely around pumpkin plants discouraged both squash bugs and weeds–a win-win situation, in my opinion, and especially helpful if you plant a large quantity of squash or pumpkins and don’t have a lot of time for egg-squishing or nymph-finding. See the infant lemon squash, still attached to the blossom? Isn’t it cuuuuute?? 3. Choosing varieties that are known to be more resistant to squash bug damage is an important step in avoiding this insect, too. For example, acorn, spaghetti, and zucchini squashes have been found to be quite resistant to squash bugs, where most summer squashes (yellow crookneck and straightneck) are very susceptible. I’ve been growing lemon squash for several years, because it seems to be less susceptible to the squash bug than other summer squashes. Plus, it’s delicious and so cute, to boot. Don’t you agree? 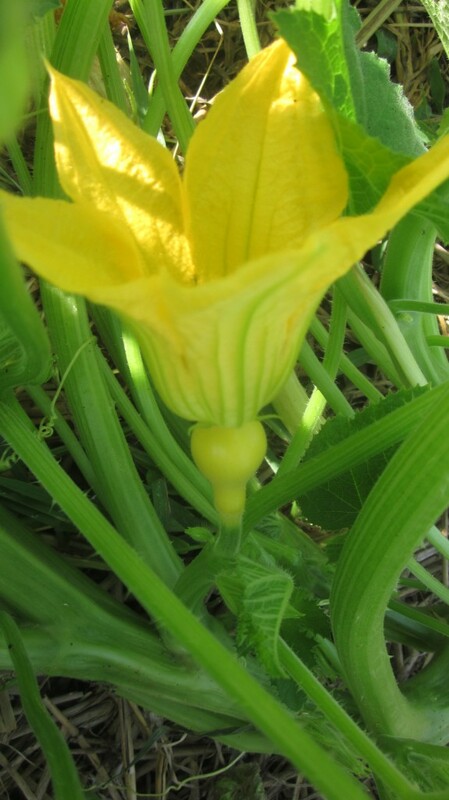 Here’s my squash plant with a cluster of soon-to-be beautiful blossoms. I couldn’t resist taking this picture, I thought it was just so lovely. So there you have it, Gentle Reader. Everything you ever needed to know (and a few things you didn’t) about squash bugs and how to control them without sprinkling that toxic dust or spraying that stinky pesticide willy-nilly. As I was out in the garden the other day, searching out little clusters of eggs and squishing little disgusting nymphs, I couldn’t help but notice the plethora of honeybees, pollinating the squash blossoms. 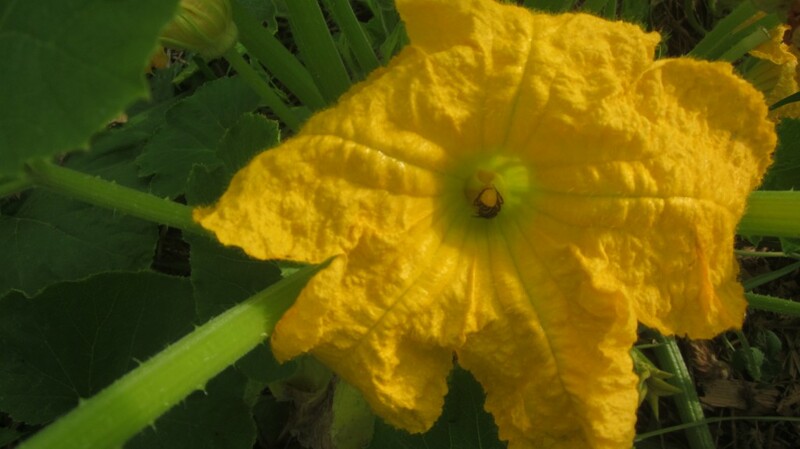 The honeybees were quite busy collecting pollen from the squash blossoms! Can you see the little lady in there? In this day when unfortunately we are struggling in the U.S. to keep our numbers of honeybees healthy, and when there are so many factors that we have no control over which are threatening the honeybee population, I’m glad that there are ways to control pests such as the squash bug that won’t harm the honeybees. Aren’t you? Thanks so much for popping in, and do come back. 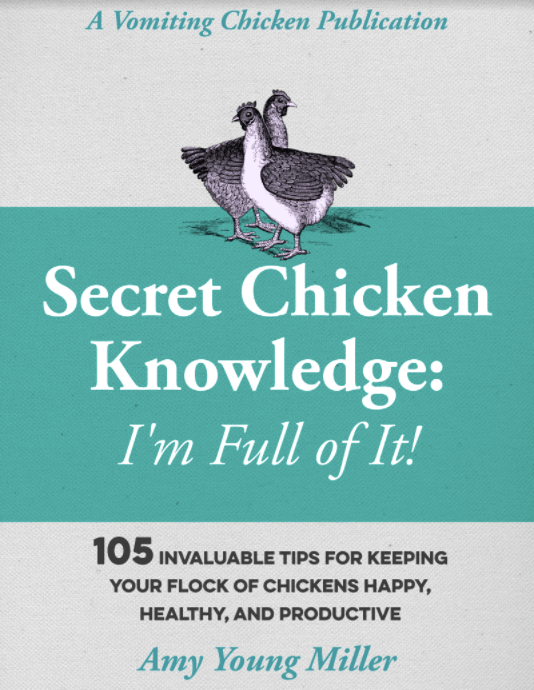 I invite you to enter your email address above, so you catch every post, and you may want to “like” my vomitingchicken.com Facebook page, because we exchange a lot of tips and tricks and whatnot over there, too! Tagged on: can squash bugs kill my squash plants?, how do I get rid of squash bugs?, how to get rid of squash bugs without chemicals, how to prevent squash bugs in your garden, squash bug eggs and nymphs, squash bugs, the life cycle of the squash bug, will a praying mantis eat squash bugs? ← Good enough for company: glazed cranberry lemon biscuits! Thanks for this. We have just moved house and I have a small garden. I am a newbie. I badly needed your advice on bugs! I like the fact that you didn’t recommend any chemical products. I hope it helps! I try very hard to only use natural products in my garden, and I’ve found good ways around using the pesticides, too, so why not? And they camouflage well too! Got to admit, they’re pretty, though I’m sure they’re a menace to squash crops! Oh, squash bugs – have squashed those eggs by probably the thousands during the years. But, one disagreement – we have actually found the crookneck yellow squash to be more resistant to the squash bug than zucchini – but that could be the difference between upstate New York and Nebraska. Haven’t tried the rotting garlic scape method – we garden in a community garden and we probably wouldn’t be invited back the following year…. After reading this I believe I will just purchase the squash from a farmer that has done the work for me. Actually acorn squash and zucchini area the only ones we had time to plant this year. And in three more weeks, everything in our garden becomes our daughters garden and we start over. Good advice that I might be able to use at our new digs. Three weeks! What an exciting time for you, Chef! Be sure to keep us posted about your move! And there are bound to be squash bugs down in Mexico, as warm as it is down there, so you’d better be prepared! Amen to that, Chef William. Zucchini are so cheap here in Missouri in the summer. I have had little to no trouble with my other veggies. I’ve nothing but trouble with the zucchini. Jennifer, the only time that I have good luck with growing zucchini and other squash is when I plant them in my hoop house. And this year (sadly) the squash bugs have found my hoop house, so it may not be ideal any longer. I may have to hit up the farmer’s market for my zukes! We will now be prepared, should the squash bug strike! Thanks! So Anita-Clare, did you find any??? The bugs sound nasty. I prefer the newspaper mulch idea, although it’s many years since I could bend enough to garden. Honeybees are a major problem here in the UK too. So many disappearing due, according to experts, to the preceeding rainy summers. You have some incredible pix here Amy. Happy squashing squash bug eggs to you! Thank you! I actually do take perverse enjoyment out of the disgusting little exercise! Great pictures~ The squash bugs in Colorado feast on our zucchini, summer squash , pumpkin and hopi plants. It is impossible for me to squish all the eggs and bugs. I haven’t tried mulching with newspaper and straw yet. Enjoyed reading your article. Just found a ton of them last night on my yellow summer squash – none on the zucchini sharing the same raised bed. My first reaction was to shoot em all with soapy water which seems to have killed most of them – followed up with some more on the remaining ones this morning. Sprayed the globs of eggs but now think I’d better get back out and smash em. Thanks! First time in years of gardening that I’ve had these particular nasties. I just destroyed some Cocozella zucchini plants that were heavy infested with squash bugs. How can I make sure these nasty things don’t overwinter to next year’s garden? I will be sure and remove any and all detritus and straw mulch. Will they overwinter in the soil? They WILL overwinter in the soil (alas), Jennifer. You can plant your next year’s squash crop in another area of the garden and hope that they won’t find it. They are a formidable pest, however, and though I employ all the strategies, I still find myself squashing them every summer. They are just awful, once you get started with them, it’s hard to get rid of them. My solution to squash bugs just discovered today, is that next year I’ll buy my squash at the local farm stands and markets. No, they are different bugs, but you don’t want either one! I do think Squash bugs and stink bugs are related! Thanks for updating this, I just was clued into the distressing infestation of my squash. I want them dead before breakfast! but dont want to hurt the bees that LOVE the blossoms.